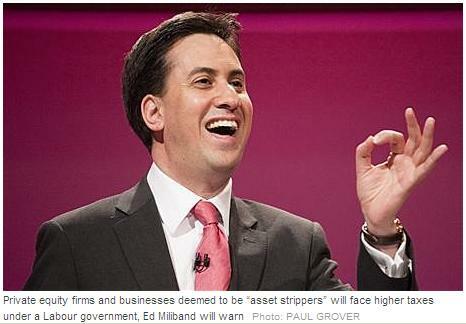 or alternatively: "Ed Miliband greets his old friend The Invisible Man". According to the Torygraph, Britain's trades unions are planning to ballot their members on strikes in response to the government's desire to make public servants pay a bit more for their pensions. Apparently, two million of the six million public sector workers are to be consulted on "industrial action". Firstly, I don't know why it's called "industrial action". None of these desk jockeys has ever worked in an industry and they are planning a day of inaction, not action. Then, they have the temerity to suggest that they have a right to strike. No they don't. They are a minority of workers within the civil service (one third). They have the obligation to provide the education, health and social services that my tax pays for. If they have a gripe with their employment terms, take it up with your boss or get a new job. My tax pays for their salaries and pensions. It even pays for some union officials to strut around government offices looking for excuses to disrupt the public. It's not asking much for some of MY money to be used by THEM to save for their retirement. They have had it too easy for too long. Forty-eight years after the original Great Train Robbery, Edinburgh City Council are mugging the residents of Scotland’s capital for about £1bn to pay for the most expensive train set any child could ever wish for. The Edinburgh Trams project started construction in 2008 and after many contractual and political delays is now scheduled for completion in 2014. What was originally costed at under £400m is now going to cost three times as much and deliver less than a third of what was originally promised in terms of route and capacity. Hopefully a public enquiry, which itself is about 18 months overdue, will name and shame the culprits within local and central government as well as the contractors who are probably less than golden. But what really irks me about the whole scheme is that it shouldn’t be built at all. Why does Edinburgh need yet another service for carrying commuters from the West of the city to the centre? There are already several buses that operate from the airport and its environs that work perfectly well. Adding trams to the mix is an expensive and unjustified option. One of the Scottish Nationalist Party’s many mistakes was the cancelling of a rail link from Edinburgh airport to the centre. Although they were correct to cancel the particular Edinburgh Airport Rail Link with its expensive tunnels and additional trains, they were wrong to discount train travel entirely. Indeed the main reason for canning the Rail Link was that it duplicated existing bus routes… which is exactly what the tram link is also doing. But for some reason it is alright to spend £1bn on trams because it’s green. But there is a better, faster and cheaper alternative: don’t spend £1bn on any trams and invest in the existing transport infrastructure. The main line carrying trains in and out of Edinburgh from the north of Scotland, connecting to the central hubs at Haymarket and Waverley, passes 300m from the end of the runway at Edinburgh airport and about 1000m from the main terminal building. Compared to spending £1bn on trams or £650m on a dedicated link, it would cost low tens of millions to build a new station at the end of the runway and connect it to the terminal via a shuttle bus. There is already a road infrastructure in the vicinity and existing trains could carry passengers to/from the station. It should also appease the carbon counters, since this service will be quicker than road travel and would encourage less people to use cars and buses to get to the airport. Which begs the obvious question: why has no-one suggested this to the councillors in Edinburgh? Are the residents of City Chambers so blindly devoted to their shiny trams that they are willing to throw £1bn of our money at a project that at best will duplicate an existing bus service. Of the £560m still to be spent on the trams project, a new station, signalling and associated services will leave about £500m to be spent on more worthy projects for the capital, or better still not spent at all. Alistair Darling's memoirs were unleashed on an unsuspecting and uncaring nation last week. At least the 'best' bits were. Well, I say 'best'. Most likely to cause a minor ripple of embarrassment, more like. What did we learn from Old Caterpillar Eyebrows’ diaries? Gordon Brown had a bit of a temper and Ed Balls (by name and nature) ran his own shadow treasury department. Neither of these facts are startlingly new or surprising. Brown’s penchant for flinging Nokias almost earned him a place in Scotland’s cricket team. The fact that Balls spent yours and my tax on his own pet projects means that he has even less right to comment on the nation’s finances. Let’s not forget that he thinks the answer to the UK’s economic woes is to bloat the civil service still further rather than slim it down as the Coalition are trying to do. Whilst Chancellor, Darling always insisted how well he got on with Brown and his cabinet chums. But once there was the opportunity to earn a few quid from the true story, he has been more than happy to re-write history. Which tells us nothing we don’t already know: politicians lie, Brown was a nightmare to work with and Ed Balls should never be allowed near a calculator. Ever since the ConDems got into power, I have been constantly perplexed and bemused that they don't allude more publicly to the previous administration's culpability for the mess that the UK's finances are in. Bob Crow was given airtime on the BBC this week, calling for the populace to take to the streets in defiance of these cuts, which he reckons are needed because of bankers' greed. Actually Bob, it was your party that bailed out the bankers and added significantly to the nation's debt. Gordon Brown has spent the week in dour old Fife, working on his memoirs. His chief bean counter, Alistair Darling, was similarly silent and inconspicuous this week. And why not? Red Ed would not want either of those two around to remind us all why we are where we are. And Postman Al, the new Shadow Puppet for Spending What We Don't Have, has accused Osborne of taking a reckless gamble with the spending review. At least it's a calculated and measured gamble, unlike those that Brown and Darling indluged in, which were all about buying votes and perpetuating their time in power. The Chancellor and anyone else in power that needs to defend the need for economic changes just needs to remember this simple phrase: "It's all Labour's fault". Apparently, those astute fellows at Her Majesty’s Revenue and Customs have managed to lose £2bn of tax revenue down the back of a computer server somewhere. And since this is the UK, where HMRC have only slightly less powers than the average deity, we the taxpayers are going to be expected to roll over and cough up the dough to pay for their ineptitude. The increasingly inane BBC Breakfast wheeled in a “tax expert” this morning to explain what those of us unfortunate to receive a demand for £1,400 should do. Aside from returning the envelope smeared in excrement, which would be my suggestion, we are encouraged to plan to lose £100 per month of our income for a year. But don’t worry, said the “expert”, it won’t happen until next April. Whoop-de-effing-do. But what the dopey presenters didn’t consider, and indeed what has escaped the attention of most of the media, is how did the government allow this much tax to fail to be collected? Assuming it’s the fault of a computer system – and that seems to be what is being reported – then humans are involved somewhere. Computer software, especially mildly complex programs such as tax calculators for 30 million citizens, does not just write itself, deus ex machina-style. A minister will have had an idea; a permanent secretary will have engaged with some internal stakeholders to kick off a project; consultants will have been appointed, following a rigorous process whereby the company whose CEO contributes most to the ruling party is employed; internal staff will be re-deployed from mind-numbingly tedious jobs to a position where they can obfuscate and stall the project as much as possible. And eventually an unfit-for-purpose system will be spat out, poorly-tested, over budget and several years late. Since the system in question is only just now miscalculating our tax, it is safe to assume that it was not commissioned by the present coalition government: it is simply not possible to implement a new IT project in government in four months. So, it must have been a New Labour idea. But not Alistair Darling’s: he became Chancellor in 2007 and the new software is only now being found out for getting the 2009-2010 tax year wrong. Which means it was probably instigated under the watch of the previous incumbent of No. 11. And since Gordon Brown was tighter than two coats of paint as Chancellor, evidenced by his penny-pinching with the troops in Iraq and Afghanistan, you can bet that the new tax computer was subject to a budget comparable to the cost of the average Daewoo. A second hand one. With high mileage, no service history and three not very careful owners. Darling is still culpable though, since the new system would have been undergoing testing once he was thrust into the Chancellorship. Although it was probably too late at that point to polish the pooh that Brown had laid during his time at the Treasury. The £2bn should be re-couped from the salary and pensions of all the ministers that were involved in unleashing the shambles in the first place. Now that Brown and Darling are on the opposition benches – that is so satisfying to type – they should be forced to forfeit a fraction of their stipend to make up the shortfall. A thousand quid from each of them each month should do. Which is a million months. Or 83 millenia. Plus interest. No wonder the country’s finances are screwed deeper than a Chilean miner. Brown and Darling – still a danger to the nation’s financial health. Four months into the new coalition government and the liberal (with a small “L”) media seem to delight in their daily reporting of the cuts in public services that are going to be made. So, for example, we have in today’s Torygraph “Bank of England's Mervyn King warns over inflation”, which should read “Bank of England's Mervyn King warns over inflation, due to Gordon Brown’s total incompetence as Chancellor and Prime Minister”. “60,000 police officers 'could be axed by 2015' due to Government funding cuts” from The Daily Mail should of course read “Because of the previous Labour government’s mismanagement of the economy and public finances for the last 13 years, 60,000 police officers 'could be axed by 2015' due to Government funding cuts”. And lest we forget The Grauniad, “Arts funding cuts will bring down the curtain on our theatre's golden age” is more truthfully “Arts funding cuts will bring down the curtain on our theatre's golden age, because of the previous Labour government’s mismanagement of the economy and public finances for the last 13 years”. It’s a great game to play when you listen to or watch BBC News, or read a newspaper. Try it, you’ll love it. Two weeks into the new Con-Dem, Lib-Con, call-it-whatever-you-want coalition and I feel no need to be wound up about proceedings. Every Tuesday is worthy of a celebration. Two weeks ago, Gormless Gordon got in his shiny, ministerial Jag for the last time to be driven to Buck House to hand in his resignation to Her Maj. Thirty minutes later, Dave got in his even shinier, newer Jag to be interviewed for the vacant position of Prime Minister and First Lord of the Treasury. “Yes, Dave, you seem like a nice chap, the job’s yours. And you went to Eton, so you’re a shoo-in.”, the Queen is alleged to have said. Would a “proper”, single party government have been better? Maybe. Would a government unfettered by dampening down its policies to satisfy a minority partner be better? Probably. Would a government with a clear, UK-wide majority be better? Definitely. But anything is better than having Labour in charge for another 4 or 5 years. Ex-PM Brown is now said to be “considering offers”, ranging from continuing his work as worst leader ever by becoming First Minister of Scotland to appearing as an extra in Holby City, although I think he is better suited to Grumpy Old Men. Labour are currently leaderless, unless you count stand-in boss Batty Hatty Harperson. I don’t. Her shrill posturing at Tuesday's opening of parliament sounded like someone who was reading punchlines from a third-rate comic’s discarded material. Which she was. Long may it continue: the coalition implementing policies to reverse 13 years of oppressive, extravagant, wasteful government; Labour sitting on the opposition benches in a permanent “harrumph”, lead by (probably) one of the Miliband brothers, or hopefully the copywriters’ choice, Ed Balls.